I’ve always been an avid reader. In fact, I started when I was six years old and my Aunt Lolly gave me a birthday subscription to Little Lulu comics. From there, it was a short hop to Superman, Batman, and super-sensational magazines like Monster World and Creepy that made a garish appearance on drugstore news stands in the mid-sixties. These vampire and werewolf stories both scared and intrigued me so much that I started telling ghost stories around the campfire and even snuck into cemeteries at night on a dare. Then, when I got a little older, I discovered Nancy Drew, Judy Bolton, and Trixie Belden mysteries. Here, finally, was nirvana. These were young women I could seriously relate to. They dashed all over town, crept into haunted mansions, visited caves with mysterious tolling bells, and even vacationed at spooky inns. No matter that the screaming woman turned out to be a howling cat, the bell was actually a recording, and the bad guys were only semi-bad. 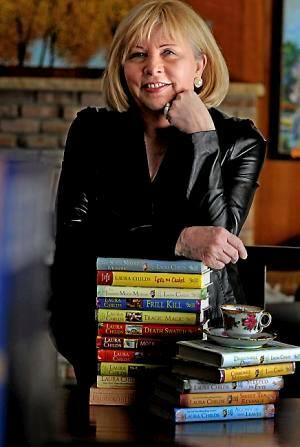 Reading these books, especially Nancy Drew, not only charmed me but planted the germ of an idea in my head that perhaps someday I could be a mystery writer, too. And as I became more and more intrigued, these books began teaching me invaluable lessons about character, plotting, and red herrings (which were liberally sprinkled throughout!) It also eventually dawned on me that a mystery needed more than just fun, exciting writing. These books also delivered a whiz-bang opening, offered a series of exciting events that carried the story through for a couple hundred pages, and ended with an exciting climax where the bad guys (or girls) were brought to justice and all loose ends were wrapped up nice and neat. Yup, Nancy Drew – and all those marvelous women who ghosted as Caroline Keene – taught me the basic fundamentals of how to write a mystery! As strange as it sounds, characters just seem to pop into my head. To me writing is about intuition and gut instinct – you have to sit back and let the characters speak to you. My characters always seem to be buzzing around inside my head like people in a crowded elevator. My job as a writer is to pry open those elevator doors and let them elbow their way out. And, yes, there does seem to be an elusive intangible known as creativity. So how do you catch that creative spark? Where do you find it? And how do you put that puppy to work for you? Well, here’s the amazing, wonderful thing. Pretty much everyone has the ability to dig deep within themselves and ignite that creative spark. It’s there, simmering away, in all of us. Creativity, believe it or not, is simply a by-product of the imagination. And the imagination is a brain-powered muscle that you flex and stretch to keep in peak working order. I think what stands in the way of many would-be writers is plain old garden variety fear. You want to write, but you’re afraid the words won’t come. Or you’re afraid you won’t have the skills, or that you won’t be taken seriously. But the truth of the matter is, you really can do it. Step one: start believing in yourself because you’re probably smarter and a lot more talented than you think you are. Step two: sit down with your laptop or tablet and (like the Nike ad says) just do it. Because you can do it! My protagonist, Afton Tangler, is a character that’s easily relatable. She’s a divorced single mom who struggles in her job as liaison officer for the Minneapolis Police Department. She aspires to become a detective – but so far it’s pretty tough going. My antagonist, Mom Chao Cherry, is a coke-sniffing displaced American and international crime boss from southeast Asia. Though advanced in age, she’s pure evil, proving that female baddies can be much more ruthless than men. Chapter one starts with a bang – literally. A helicopter carrying a heart for a much-needed transplant is shot down just as it reaches the hospital. The bad guys are really, really bad and will stop at nothing to seek revenge and recover Mom Chao Cherry’s stolen drugs. Afton has two very precocious kids, Poppy and Tess, who factor into the plot along with their French bulldog Bonaparte. But no kids or animals are ever harmed. Afton’s boss, Max, gives her enough free rein to get pulled into parts of the investigation – where she absolutely excels. Just when the bad guys are going for broke, when you think you know what’s going on, there’s a huge twist you won’t see coming. The supposedly squeaky clean millionaire has crossed the wrong person and she's not finished exacting her revenge. The case explodes into an international conspiracy of unbridled greed and violence. 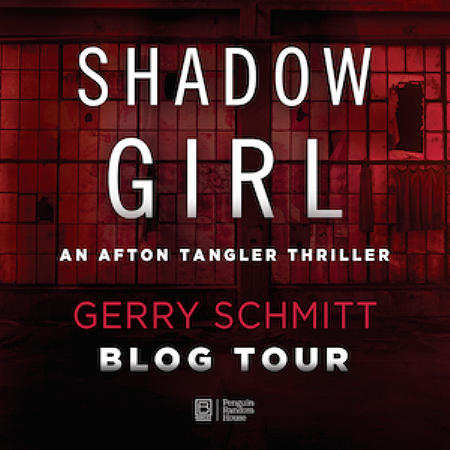 And as Afton gets closer to unearthing the mastermind behind it, she gets closer to becoming collateral damage..."
2 Winners will receive a Copy of Shadow Girl (An Afton Tangler Thriller #2) by Gerry Schmitt. "What do you think you will be doing five years from now?" More of the same, only better! I hope retired but probably still too young. Not exactly sure what I will be doing in five years, but enjoying our retirement and maybe some travel. I will be living in North Carolina with my sweetie in five years!